Parker McLachlin hit from the tee on the eighth hole during first-round play in the rain at the AT&T Classic in Duluth, Ga.
Honolulu's Parker McLachlin opened with a 6-under 66 yesterday to share the clubhouse lead of the rain-shortened first round of the AT&T Classic with four other golfers. Bad weather forced the first round to be played in sloppy conditions in the afternoon, but fortunately for McLachlin, he was among the first golfers going off in the morning and avoided the nasty weather that followed. "Wake up this morning, you look outside and you are thinking it's going to be pouring," McLachlin said. "It's pretty nice and you get pretty excited to maybe get some good weather. That was the attitude I took -- great we got some good weather, good scoring weather and let's go take advantage of it." McLachlin started on the back nine, carding one bogey and three birdies, before playing his back nine in 4-under 32. His best 18 holes on the PGA Tour is a 65, but this is the first time he's been tied for the lead in any tour event. "I hit a lot of fairways," McLachlin said. "I'm not a long hitter and sometimes I try to swing outside of myself." Dean Wilson wasn't as fortunate. 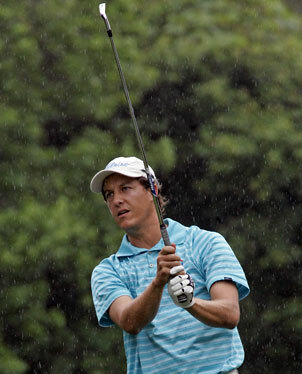 The Kaneohe native played in the rain most of the day, opening with a 1-over 73. He hit his final drive into a ravine, came out and clipped a tree limb that left the ball in the fairway en route to a bogey at the par-4 ninth. DULUTH, Ga. » Kenny Perry sloshed through the water-logged fairways, ducking under an umbrella every chance he got. Coming off a final-round meltdown at The Players Championship, Perry endured a steady -- and occasionally driving rain -- to claim a share of the first-round lead with a 6-under 66 at the AT&T Classic yesterday. The other leaders -- Jonathan Kaye, Ryan Palmer, Jonathan Byrd and Hawaii's Parker McLachlin -- all teed off in the morning, before a huge weather system engulfed the suburban Atlanta course. Perry's bogey-free round was especially impressive in light of the soggy conditions and other hardships. Perry drove his tee shot at 472-yard ninth into a huge puddle, forcing him to drop on drier ground. After hitting his second shot short and left of the green, he had to wait even longer while Hawaii's Dean Wilson got a ruling on a tee shot that faded into a deep ravine along the right side of the fairway. It was quite a comeback from his previous round. Perry went to the final day of the Players one stroke off the lead, only to close with an 81 that dropped him into a tie for 15th. "I was hitting knuckleballs off the driver," he said. "I have never seen balls do that. But I was able to recover." The remaining leaders got to play on an inviting course before the showers struck. Byrd overcame a double bogey at No. 7 with eight birdies, taking advantage of soft greens and not even the hint of a breeze. "I don't care how hard a course is -- if the greens are soft, guys are going to shoot low," Byrd said. "You can get to the flags pretty easy. You know your shots don't have to be as precise because they're hitting and they're stopping." Byrd and the others also took advantage of the weak field. Only six of the top 50 players in the world rankings are in Atlanta this week. Wilson is seven shots back at 1 over. CLIFTON, N.J. » The Annika Sorenstam goodbye tour got off to a great start. Two days after announcing this would be her final season on the LPGA Tour, Sorenstam shot a 5-under 67 yesterday for a share of the first-round lead in the Sybase Classic. Two-time defending champion Lorena Ochoa was a stroke back. The 37-year-old Hall of Famer came into the $2 million tournament off a dominating seven-stroke victory in the Michelob Ultra Open last weekend, and she was just as good getting around the Upper Montclair Country Club course in the shadow of New York City. The Swede had five birdies in a bogey-free round. "I'm just very happy the way I'm playing," said Sorenstam, who has three victories this year after failing to win in an injury-marred 2007 season. "I worked really hard this winter and it's all coming together."